lesliekeating: not so grouchy anymore! so on sunday night i was perusing the internet for christmas gift ideas and found myself in the wonderfullness that is ink & spindle. 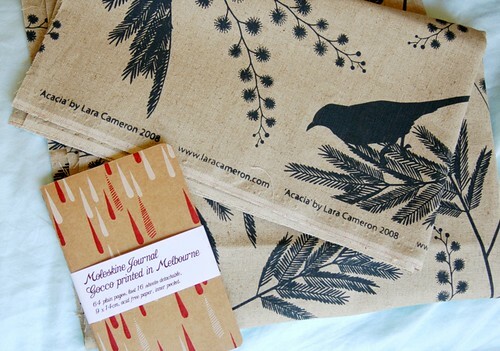 i'm sure 99.9% of you are familiar with them but for the .1% who aren't, three melbourne girls, each super talented fabric designers, combined forces to open their own screenprinting studio to offer their handprinted wares. 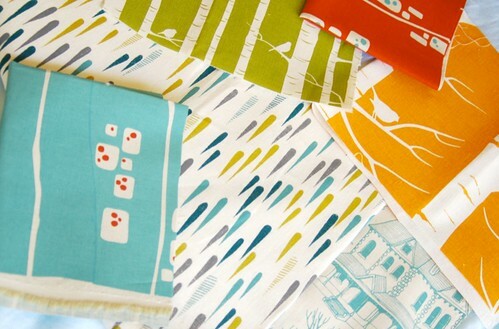 i've been reading lara's blog for years, before she even printed her first piece of fabric, and it's been wonderful to watch her designs evolve and grow so popular. i've coveted so many of them and, for one reason or another, haven't let myself buy any so i jumped at the "excuse" to snap up some of her acacia design in grey for holiday sewing (being a bit vague about what i'm making and for who as i'm never too sure which family members read this and how often). a bunch of what she calls "scraps"! these, my friends, are NOT scraps, the raindrop one (my favourite EVER lara cameron design) is bloody huge and destined to be a cushion for our couch if i can ever stop grinning like an idiot when i look at it! they are all so, so lovely and definitely snapped me out of any residual grouchiness i may have been experiencing yesterday. thank you again, lara, you rule! Oh Leslie you're too kind. Thanks so much for this lovely post, glad it brightened your week. It sounds like she's overtired, which might be the cause of the meltdown at bedtime. I would try and get longer sleeps in the day by resettling in the cot (patting is good) and maybe a catnap in the afternoon to get her through to bedtime. Feeding to sleep is ok if you want to keep doing it, but if you use it now as a sleep association, no one else will ever be able to put her to bed! I would wrap, put in the cot and sit and pat until she is calm and relaxed, and then leave her to fall asleep on her own. Believe me, starting now at this, even a few times practice a day, may save your sanity later! i think the overtired thing is right, although she seems to nap a lot throughout the day, they are usually pretty short, an hour max. she had a three hour nap (the first in ages) this afternoon and went to bed normally tonight. i just wanted to clarify the sleep/feeding thing though - am i not supposed to feed her before bed at night? everything i've read has said a good nighttime routine is a bath and a feed and it seems logical if you want them to sleep for longer periods of time. it usually works out that her bedtime is 2 hours or more from her last feed so i'd worry that she'd wake up starving soon after we put her to bed, after a big struggle to get her to settle down. she's awake but sleepy when i put her to bed after feeding and then takes a dummy to get to sleep. during the day i feed her roughly every three hours and she doesn't nap right after eating. she'll play for awhile and when she starts rubbing her eyes and grizzling a little bit, i swaddle her, give her a dummy and either put her in her swing or her cot for a nap. i AM a bit worried about her reliance on the swing for naps so i'm trying to use the cot more. one other thing i'm worried about is the swaddling - when does that stop? how do we transition from not swaddling? she won't fall asleep without it now. thanks again, i appreciate any advice you can share! No, that sounds great, hope it can help others too. This is just one way of thinking, though, so if anyone has a different view, that's fine too. Mae's daytime sounds great, actually, they are pretty long sleeps, even an hour is good. Usually they catnap for 40 mins and that's makes them really overtired, so if you get an hour, great. You're bedtime routine sounds right ,too, it's the only feed where you put them down groggy after a feed, but hopefully not asleep. Sounds like today was a good one and you've seen it in action, so hey, if it's working, don't fix it haha. Bad days are inevitable, unfortuntaly. I believe SIDS guidelines recommend swaddling until 4 to 6 months, when rolling makes it dangerous for swaddled babies. You can either wait and tackle it a bit later, or in the meantime start loosening it a bit and occasionally let a hand out, just give her lots of chances to practise getting used to it. It only takes a few times to make a habit, so I would alternate the swing and the cot. Email with me anyway if you want books or references, as I don't like coming across too one sided as well. she's too cute with that card, too! I really hesitate to give advice, as grace was a pretty easy going baby - however we got lots of advice when we were in the mother/baby unit at about this age, so here goes. They generally recommended a routine of feed/play/sleep during the day so what you're doing there sounds spot on. As does the observation about overtiredness. Perversely it seems harder for most children and babies to go to sleep when they are too tired. (Grace at 8.30m is a nightmare, at 7.30pm bedtime is a delight). When she was little, we always gave Grace a feed before going to bed at night and middle of the night time feeds were to be in low light and straight back to bed. They also emphasised trying to get a good rythym of naps during the day. Even if you had to delay naptime a bit. I think Grace had three and then transitioned to two longish daytime ones at about five months. We swaddled until it stopped working, at about three months - she just stopped liking it, but all babies would be different there. We tended to put Grace to bed and let her have a bit of a grizzle, return and reassure etc. But as I said, she's always been a pretty good sleeper. Unlike my niece, poor betty (my sister) expected ruby to sleep like grace. never mind, grace throws a mighty impressive tantrum and is still half in nappies at three and a half. I'm sure you're doing the right thing. Just got to trust your own sense of what is right for you and mae. Hi, I have been reading your blog for a while now and I love it. My boys are 3 1/2 and 18 months and it sounds like you are doing it all perfectly to me. The sleep thing is not easy! I have trouble remembering what to do (I do have a 10 month old!) Just go with what works for you and have a flexible routine. I would keep swaddling if Mae likes it. My second one is still highly attached to her muslins, and my little boy worked his arms out himself, but has only recently swapped to a sleeping bag with his muslin lighly on the top. I guess everyone is different! You sound like you're doing really well, just remember, each little stage only lasts so long and then they change! 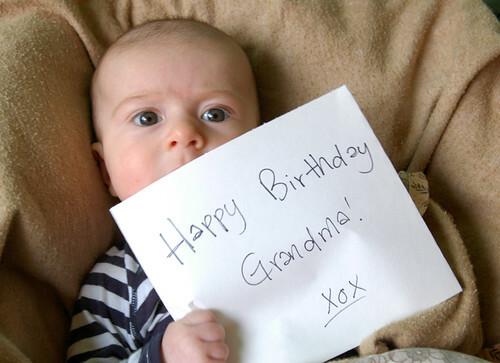 Cute cute sign to Grandma! PS. Love all your sewing. Just beautiful!